07.14.10 On September 18th Maine will go to battle. The 1st Annual Maine vs. New Hampshire Chess Border Battle will commence. The event will feature 10 top players from Maine vs. 10 top players from New Hampshire. Be a part of the 1st Annual Maine vs. NH Border Battle! If you are interested in representing the state of Maine in this match please contact Steve Abrahams at beez2310@msn.com with your level of interest and rating. Steve will gather all the players interested and pick the ten best players who are available. The event will be FREE sponsored by the Maine Chess and New Hampshire Chess Associations! Each player will play two G/60 USCF rated games against the same seed opponent from the opposing state. The winning state will win the coveted Border Battle Cup! The event will take place in Portsmouth, NH on September 18th in the Portsmouth Public Library Levenson Community Meeting Room. 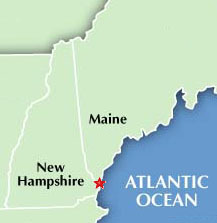 Please help Maine take down our neighbors to the west and claim the Cup! Please contact Steve Abrahams at beez2310@msn.com with your interest. Hope to see you at the Maine-NH Border Battle!